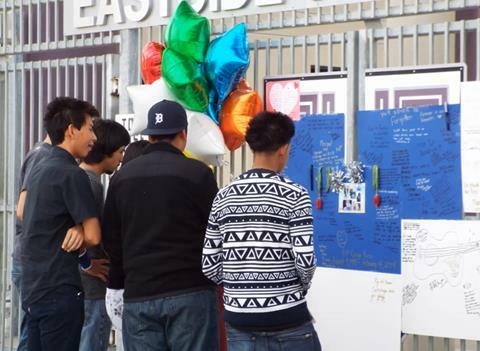 LANCASTER – Dozens of students and teachers gathered in front of Eastside High School Saturday to remember Gage Rossi, the freshman hit and killed by a car as he crossed the street to catch his bus to school. Gage was a confident teen who enjoyed clowning around, his friends said. 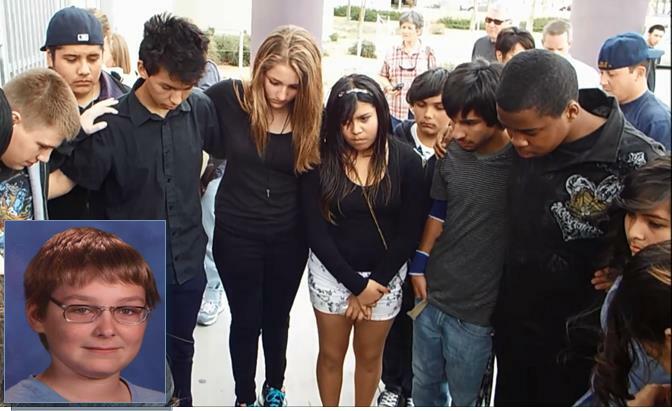 Gage was a confident, easygoing 14-year-old who loved to play the guitar and had many friends, those that knew him said. “One time when he came in class, he made a leap for a chair and he missed, and that was just his way of clowning around,” said Gage’s biology teacher Park Mickelson. “Another way that I remember him is when he brought in his guitar and played ‘Smoke on the Water’, and that was just a fantastic, fantastic thing,” Mickelson continued. The Lancaster collision that claimed Gage’s life happened around 6:10 a.m. Friday, Feb. 14 on Avenue J, just east of 140th Street East. Gage was crossing Avenue J to get to the school bus, when he was struck by a car that was passing the school bus, according to a California Highway Patrol report. Read more details of the collision here. “This was preventable,” Gage’s mother, Laura, said at Saturday’s vigil. Laura said she had asked to have the bus rerouted so Gage wouldn’t have to cross the 55 mph street to get to his bus stop, but she was told there was no money in the budget. “There’s just no reason he should have had to cross that street in the dark to get on that bus when there’s plenty of room on the other side of the street… it’s just ridiculous,” Gage’s father, Dean Rossi, said. Antelope Valley Schools Transportation Agency did not return calls for comment, but they released a statement saying they were conducting “a thorough in-house investigation” and would respond accordingly. 10 comments for "Vigil remembers boy hit, killed by car"
I work for Lifetouch & was wondering what Jr High Gage went to so the company can order a grievance package for the family. I only ask about the jr high because we (lifetouch) does not photograph Eastside Highschool. I have 3 teenagers myself that attend Eastside & my Boyfriend works there. I cannot even imagine what the parents are going through. This is a hard, sad, difficult, trying time. I think the focus should be praying for all that are involved. Its called an accident for a reason & let the investigators do their job. As third party people, we all can speculate what may or may not have happened, but only the investigators are able to come up with the answer. I myself went to school for criminal law, & despite what some believe, there is no reason for an arrest. It was an accident by all involved & if negligence is found, then maybe vehicular manslaughter may come into play. If the driver has a conscience then I’m pretfy sure they will have guilt & remorse the rest of their life. Bottom line an innocent child was lost & no matter how the blame is passed around nothing will bring him back or take away the grief & saddness away. We need to come together as a community & give our prayers & condolences to Gage’s family. No need for negative or derrogatory comments here. God bless, R.I.P, prayers to the family. He went to Cole Middle School – I know this because my son and he are friends and went there together. FYI – Gage’s funeral is Saturday, 2-22-14, and Lancaster Baptist Church off 40 St E and Lancaster Blvd., 2 pm. I get so upset watching those kids dodging traffic just to get to school. Clearly a crossing guard / cross walk / stop light something is needed on K and 35th east as well. AVUHS is run by people wanting to line their pockets without a care in the world for the kids. The family needs to hire an attorney and sue. Then at least the admin will have to answer to the insurance company. 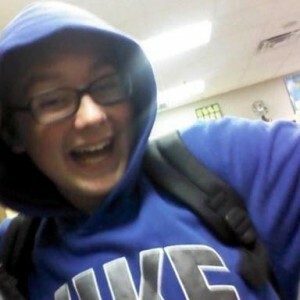 Although I did not know Gage, just his smile lets me know what a good son he was. To gage’s mother..your son was and is very loved by his peers at school..this group of friends was a family.. and now a closer bonded family with the passing..this truly is a tragic loss that has cut many deeply.. your son meant a lot too many people..being a mother myself I can’t ever imagine the pain of which you must go through my heart bleeds for you and sheds so many tears..from the moment my daughter text me from school my heart sunk for you and your husband… please find the little comfort in knowing that your son will live through these children he called his family at school his.. Ohana family is never forgotten or left behind.. may God be with you to heal your heart and dry your tears <3 …please lets not let this passing be forgotten EVERYONE stop being in such a hurry life is too short SLOW down!! Love and care for one another!! It’s too bad that a young man was killed. The AVUHSD and the AVSTA should be held responsible. If it was a school bus then there must be an adult present at all times, so someone has to know what happened. 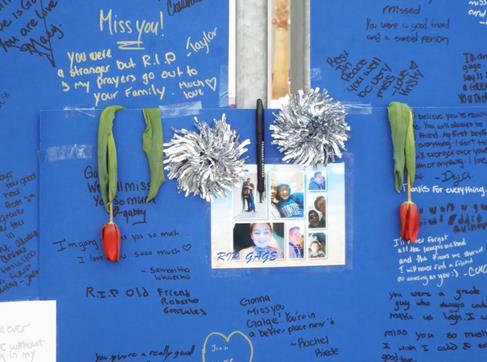 The school bus driver didn’t even get off the bus, but sent two teenage kids to cross that very same road where Gage had just been killed to knock on his family’s door and inform them their son had been hit by a car. This floors me. The bus driver is the adult – and should have shut off the bus and crossed the road, NOT send two more young teenagers to cross that road. If I could SLAP that bus driver, I would. Do you think maybe she is not supposed to leave her bus full of kids unattended?